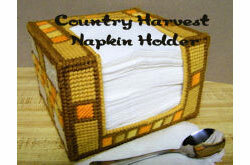 Stitch up a pretty holder for paper napkins, to use for casual dining, picnics or buffet. Pattern includes color stitching charts for 7-mesh plastic needlepoint canvas. Approx Finished Size: 6" x 6".